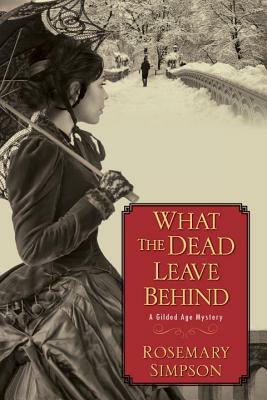 Set amidst the opulent mansions and cobblestone streets of Old New York, this enthralling historical mystery by Rosemary Simpson brings the Gilded Age to life—in a tantalizing tale of old money, new love, and grave suspicion . . .
As the Great Blizzard of 1888 cripples New York City, heiress Prudence MacKenzie sits anxiously within her palatial Fifth Avenue home waiting for her fiancé’s safe return. But the fearsome storm rages through the night. With daylight, more than two hundred people are found to have perished in the icy winds and treacherous snowdrifts. Among them is Prudence’s fiancé—his body frozen, his head crushed by a heavy branch, his fingers clutching a single playing card, the ace of spades . . .
Close on the heels of her father’s untimely demise, Prudence is convinced Charles’s death was no accident. The ace of spades was a code he shared with his school friend, Geoffrey Hunter, a former Pinkerton agent and attorney from the South. Wary of sinister forces closing in on her, Prudence turns to Geoffrey as her only hope in solving a murder not all believe in—and to help protect her inheritance from a stepmother who seems more interested in the family fortune than Prudence’s wellbeing . . .
Rosemary Simpson is the author of two previous historical novels The Seven Hills of Paradise and Dreams and Shadows. She is a member of Sisters in Crime and the Historical Novel Society. Educated in France and the United States, she now lives near Tucson, Arizona.